The restorative power of massage. And Whippits. Ugh. I’ve been feeling kind of ill for the past few days so haven’t really felt like writing. Every bite of food seemed out to get me, and what did I ever do to you, food? Yeah, that’s what I thought. Nothing. Anyway, I had a massage scheduled on Monday and I decided nothing, not even relentless stomach cramps, was going to keep me from it. Made dinner, picked at it, left Dash in capable Daddy hands, and hit the road. And as I walk in the door anticipating how wonderful it’s going to be, it dawns on me that it’s 6:30 at night. It’s 6:30 at night and I’m wearing sandals. It’s 6:30 at night and I’m wearing sandals that I’ve been wearing ALL day. For like twelve hours. In the heat. People. I know I’m not alone in this. All day in last year’s sandals in the heat in the sweat, etc, etc, equals gross, yes? Yes. A light dread fell over me as I considered my feet being touched by this poor woman. I would have been mortified. Why the hell didn’t I think of this at home? Morals of this story for me are quite simple. Number one, massages are great and I need them on a regular basis. Number two, get some new sandals forthesakeofjesus it’s a new season! Oh, oh! The Whippits, right. So I walked down to Granny’s house for lunch yesterday. The walk was great. Beautiful weather, Dash being his cute self in the MobyWrap, me being my cute self in a skirt. You know, the usual. The only mistake was walking down Brighton Ave. instead of heading into the neighborhood to avoid the heavy traffic. I got what I asked for. Ok, but focus. The Whippits. Right. Immediately my head is racing. She didn’t just say what I think she said. She doesn’t mean what I think she means. Does she know what a whippit is? Did they do that in high school too? She reaches into the cabinet and pulls out this. Ah yes, the WhippEt. A Whippet cookie. That’s different. For the uninitiated, and I imagine there are many of you, the Whippet hails from Canada. 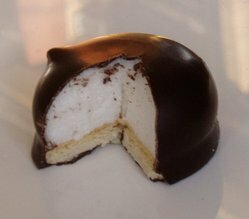 It is a cookie base topped with marshmallow and covered with dark chocolate. It looked, and still looks, pretty nasty but was surprisingly ok. Not that I’ll be rushing out to buy them any time soon. And you know, it was fun to imagine, but I suppose it’s good to know senior citizens aren’t all wrapped up in the relatively juvenile highs of nitrous oxide, eh? This entry was posted on Wednesday, July 11th, 2007 at 10:15 pm	and is filed under Misc.. You can follow any responses to this entry through the RSS 2.0 feed. You can leave a response, or trackback from your own site.